As we noted recently here on GreenMonk, technology is revolutionising the healthcare industry, and the pace of change is astounding with new products and services being announced daily. We were recently given a demonstration of two products currently being developed by SAP (Genomic Analyzer, and Medical Insights), and they are very impressive products. The Genomic Analyzer (pictured above) can take large numbers of genomes and interrogate them for various traits. This may sound trivial, but this is a serious Big Data problem. 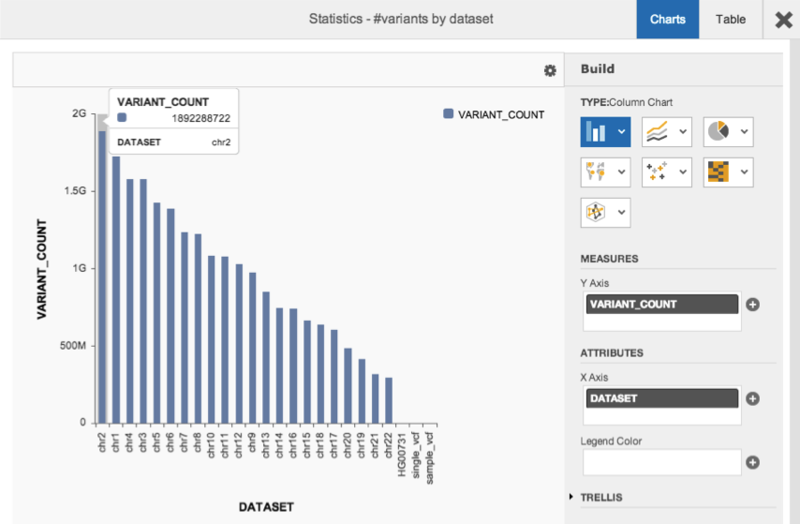 In a talk at SAP’s Sapphirenow conference in June, Stanford’s Carlos Bustamante outlined the scale of the issue when he noted that in sample size of 2534 genomes takes up 1.2tb of RAM and consists of over 20bn records. The industry standard for storing genomic data is in a variant call format (VCF) text file. This is then interrogated using either open source or some specialised commercial software analyse the genomic data. Researchers frequently have to write their own scripts to parse the data, and the parsing takes a considerable amount of time. On the other hand, SAP’s Genomic Analyzer, because it is based on SAP’s in-memory database technology, can take record sets of 2,500 genomes in its stride returning multi-variant results in seconds. This will allow previously impossible tests to be run on genomic datasets, which opens up the potential for disease biomarker identification, population genetics studies, and personalised medicine. SAP are actively looking for research partners to work with them on the development of the Genomic Analyzer. Partners would typically be research institutions, and they would receive login access to the analyzer (it is cloud delivered), and the ability to create and run as many query sets as they wish. 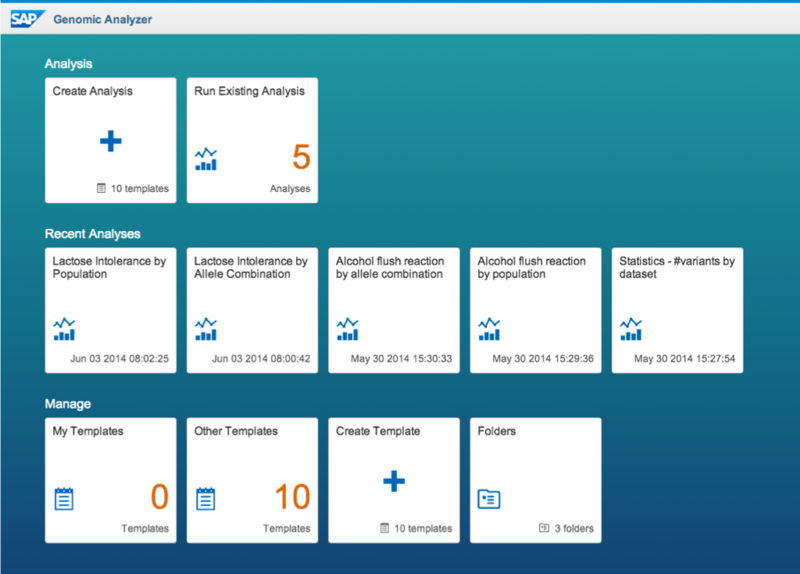 SAP’s Medical Insights application again takes advantage of SAP’s Hana in-memory database to take in the vast swathes of medical data which would typically be housed in siloed data warehouses (EMR’s, scans, pathology reports, chemo info, radio info, biobank system, and so on). It can be used to quickly identify patients suitable for drug trials, for example or to surface new research when relevant to patients. The medical Insights solution is currently being developed as part of a co-innovation project with a large cancer institute in Germany, but will ultimately be applicable to any hospital or medical institution with large disparate data banks it needs to consolidate and query. SAP are far from alone in this field. As well as developing innovative medical applications themselves, many in their Startup Focus program are also furiously innovating in this field, as previously noted. Outside of the SAP ecosystem, IBM’s Watson cognitive computing engine is also tackling important healthcare issues. And like SAP, IBM have turned Watson onto a platform, opening it up to external developers, crowdsourcing the innovation, to see what they will develop. The main difference between IBM’s cognitive computing approach, and SAP’s Hana in-memory database is that Watson analyses and interprets the results on behalf of the researchers, whereas Hana delivers just the data, leaving the evaluation in the hands of the doctors. And news out today shows that Google is launching its Google X project, Baseline Study so as not to be left out of the running in this space. There’s still a lot of work to be done, but the advances these technologies are starting to unlock with change the healthcare industry irreversibly for the good.